We see many stories around about miscarriage. 1 month after my husband and I were married, we conceived our first baby. It was so fast I swear he just looked at me and I was pregnant! It was so easy and we were ready. I loved those first 11 weeks. I was growing a life and the third piece to our family puzzle. At the 8 week mark we went in for a check up to get our first listen to our baby’s heartbeat. I am sure you can feel the excitement at this point. There was no nervousness because I was naïve enough to think nothing could go wrong once you got pregnant – that was the hard part right? The first sound of our child’s heartbeat? We were crazy excited! I was already worried by the lack of heartbeat at this point, but the internal ultrasound to determine if my baby had died, was a bit intrusive at that point. There was no preparation….just do it. In fact, as it turns out, my baby died 6 weeks before. That was incredibly devastating because I felt pregnant the entire time. 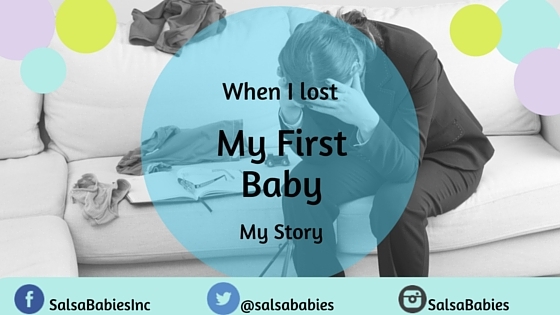 In fact I felt pregnant even after they told me my baby died. Unfortunately the story doesn’t end there. There was still the issue of the fetus that would not come out. The next process was incredibly frustrating. Over the next 3 days there were numerous appointments and consultations to get me ready for my “Missed Abortion”. Yup, that’s the medical term for when your fetus dies and doesn’t come out on its own. “IT IS NOT A F#@ING ABORTION!!! I did not choose this and I am not choosing to abort it. And then I got a bit more hysterical. We went through the horrible procedure and the next few days I don’t remember much of. We were lucky enough to conceive again the very next month and go on to have 3 more beautiful babies, but that was a devastating time and process. The interesting thing on the flip side of all of this is just how common I found out miscarriages are. After I recovered and went back to work, I found out that all 6 of the other women in my office had also had a miscarriage at some point. You really don’t see how common it is until you have one and then everyone is willing to share their stories about their own circumstances. It doesn’t change the loss, and doesn’t change the hurt, but it is nice to know you are not alone and almost all go one to conceive successfully ( and many times!) after a miscarriage. We really are a mama community! Are The Movements Appropriate for Babywearing? Choices… Why educating yourself on mom and baby classes is key!